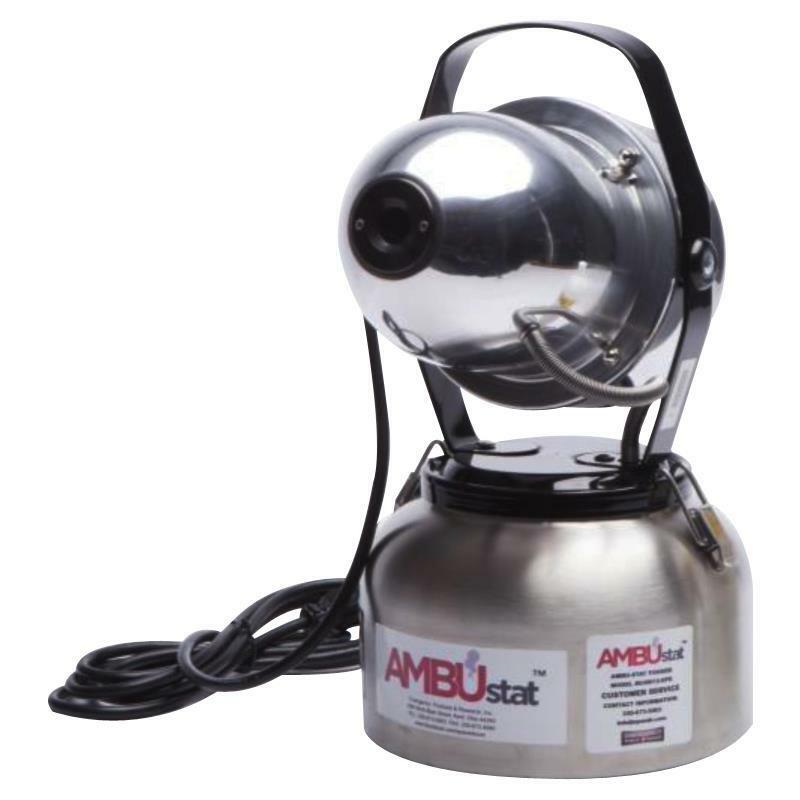 The Ambu-Stat fogger is designed to atomize Actril Cold Sterilant into small droplets (fog, mist or spray) by shearing them in a highly turbulent section of the nozzle. A blower in the power head supplies air to create the turbulence. The liquid flowing into the nozzle, regulated by the fixed liquid flow rate restrictor assembly, determines average fog droplet size. The restrictor assembly shipped with this fogger was selected to generate a dry fog - small droplets that float extensively and diffuse widely. Through the use of interchangeable restrictor assemblies, of differing sizes, the flow rate can be decreased or increased. A larger flow rate (e.g., 4-8 ounces [100-250 ml] per minute) produces progressively larger droplets (wet fog, fine mist) that could be used for special decontamination circumstances. To achieve a desired level of decontamination, an appropriate quantity of Actril Cold Sterilant must make contact with the targeted surfaces and that quantity of Actril Cold Sterilant must stay in contact with the targeted surfaces for specified length of time, otherwise known as dwell or contact time. Fogs are useful for this application, because they can deposit a very thin layer of liquid droplets, using less chemical and speeding up drying.